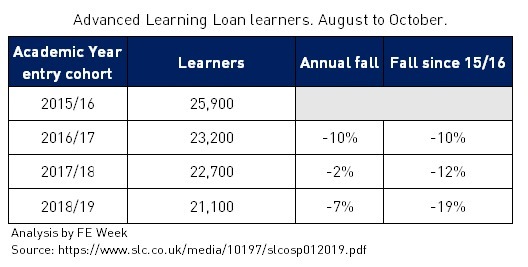 The number of people taking out advanced learner loans in the first quarter of the academic year has fallen for the third year in a row – with stats for 2018/19 down 19 per cent on 2015/16. Meanwhile, the overall number of learners starting a loan during 2017/18 fell by 13 per cent compared to 2016/17 – 83,900 dropping to 72,800, according to new figures published by the Student Loans Company today. It comes despite the Student Loans Company lowering the eligibility age for a loan from 24 to 19 two years ago. 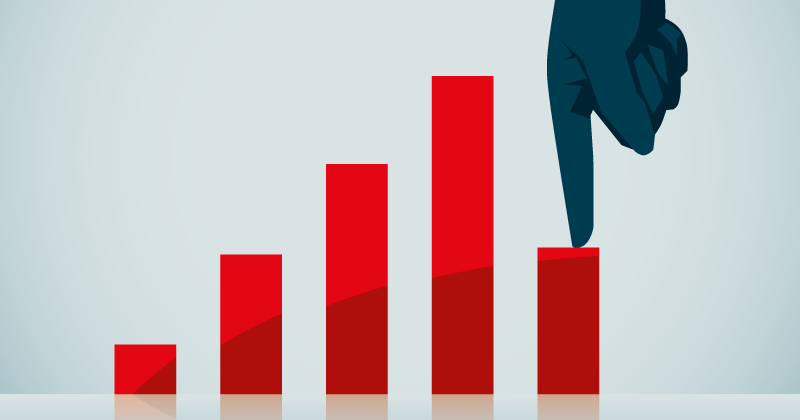 The number of people taking out an FE loan between August and October has fallen steadily ever since 2015/16, when 25,900 loans were taken out. This number dropped by 10 per cent for the same period in 2016/17 to 23,200, and by a further two per cent in 2017/18 to 22,700. From August to October 2018/19 just 21,100 people took out an FE loan, which represents and 8 per cent fall for the same period in 2017/18 and a 19 per cent drop on 2015/16. Shadow skills minister Gordon Marsden said: “These stark figures show the Government’s loans system continues to fail. Year on year half the allocated money goes back to the treasury unused. “We have consistently said, since their introduction, and I reiterated this only this week in Parliament, that expanding loans and scrapping grants was always going to have a negative impact on the take-up of vital adult courses. “And as today’s awful statistics show, successive Tory-led governments have completely failed to understand the needs and concerns of mature learners and others who’s circumstances are likely to be very different to traditional entrants at 18. The advanced learner loans policy hasn’t been a huge success since it was introduced in 2013. At the end of 2017, FE Week revealed that a massive 58 per cent of FE loans funding – amounting to almost £1 billion – had not been spent since the policy was introduced. The shocking figure, which was discovered after a Freedom of Information request, was confirmed by the Students Loans Company, which confirmed that just £652 million in loan-funded provision had actually been delivered since 2013, against a massive £1.56 billion in allocations. Loan eligibility was expanded in 2016/17 to include 19- to 23-year-olds, and courses at levels five and six. The Education and Skills Funding Agency had previously recognised they had a problem overseeing loans funded provision, particularly where much of it is subcontracted. In August 2016 the agency banned new subcontracting contracts for advanced learner loans, with a complete ban coming into force last month. In addition, growth requests for advanced learner loans were paused in September last year, while in November the ESFA introduced caps for how much loan money can be allocated to a provider. The combination of all these points is likely to be the reason for the fall in the number of people taking out the loans. The introduction of loans was just an accounting trick to transfer public spending to private debt and get it of the balance sheet. But that’s changing. We know there are concerns about re-payment rates and there are compelling reasons to suspect the cost to the public purse is now greater under loans that is was for direct public funding (ie selling off portions of the loan book for less than half the face value etc). All smoke, mirrors and spin. If it’s costing the public purse more per unit and participation is falling, then it ain’t working, but I’m sure some people will be doing very nicely out of it…..
FE students differ greatly many are re-entering education after a significant time spent working, They are generally from a less affluent demographic more acutely aware of the problems loans can bring unlike an 18 year old HE student that just sees another source of free money.